Leaking pipes in home are every owner’s worst nightmare. A suddenly burst pipe can cause major damage to your home, property, and furniture. Luckily there are ways of dealing with a leaking pipe other than panic. There are some reasons why pipes in the home leak. It could be due to incorrect installation, wear and tear due to age, and due to severe weather conditions. No matter the reason for the leak, there are various ways you can take care of a leaking pipe yourself. Also, depending on where you live, a professional may not be able to come out to your house for a few days, and you will need to take care of it yourself to avoid water shortages. The following tips will help you take care of a leaking pipe in the case where a Plumbing Contractor is not available in your area. The first and vital step to repairing a leak in your pipes is to shut off the water supply to the leaking pipe. Should it just be a minor leak, you can shut off the water supply to that pipe only. However, if you need to do some major repairs to burst pipe or multiple leaks, then it is best to shut off the complete water supply. The valve to shut off the water is usually at the supply valve fixture on the pipe that leaks or at the main supply valve. Shutting off the water supply is important as it will stop the water from flowing and gives you time to get organized to repair the leak. The second important step is to determine the sort of damage to the pipe. Investigate the pipe and determine if it’s a pinhole or a split in the pipe. Determining the damage will allow you to figure out the best repair method to use. Also, the material of the pipe is important to know when trying to decide on a repair method. Copper piping will need a different repair method to plastic. These repair tips are non-permanent but will be sufficient to get your water running again until a professional plumber comes out to your property. Should the leak come from a pinpoint-sized hole, you can insert a pencil point into the hole and break it off. Then use electricians tape to hold the pencil point in place. With plumbers epoxy putty, you can cover the hole and tape to ensure the leak repair is secure. The putty will take approximately half an hour to set. After the putty has set, you can then turn the water back on. Alternatively, if you do not have any plumber’s epoxy putty or electrician’s tape, you can use a piece of rubber. The rubber can be from an inner tube and wrap the rubber around the pipe. You can use c-clamps to wrap the rubber around the pipe tightly and to hold the rubber in place. Should you not have any c-clamps, you can use ordinary hose clamps. Be sure the clamps are secured tightly and that the rubber around the hole is firmly secured to prevent any further leakage. 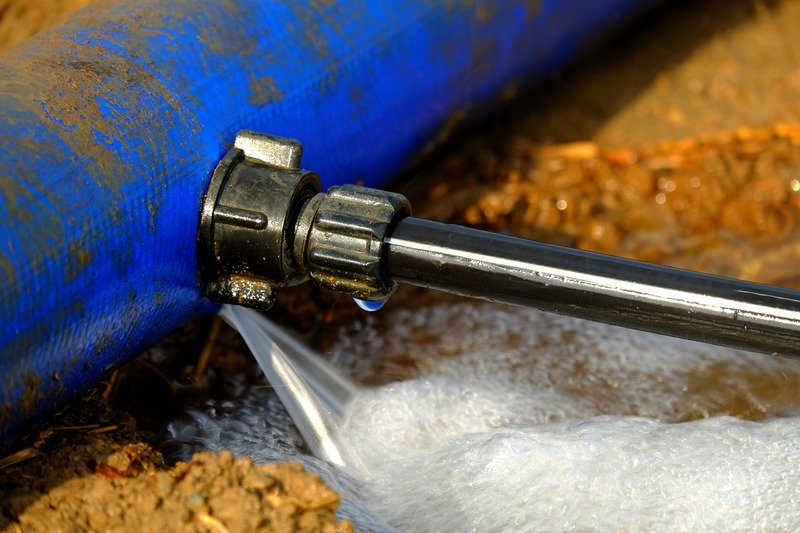 A third method for repairing a minor leak in a pipe is to use a piece of ordinary garden hose to cover the leaking area sufficiently. Be sure to cut the hose to gives you about 2 or 3 inches on either side of the leak. Slice open the piece of garden hose lengthwise and place it over the leak. Then use hose clamps or c-clamps to hold the piece of hose in place. Permanent repairs will require a bit of planning, time and investment in equipment. Permanent repair solutions cannot be done using ordinary household items like temporary repairs. However, permanent repairs are a long term solution. You can invest in a specifically designed pipe clamp. This pipe clamp comes standard with a rubber gasket that is designed to fit around a pipe with a leak. The installation is very simple, as you only need to place the clamp over the leak and tense up the screws. Tightening the screws will ensure that the clamp is held in place and makes a permanent seal around the leak. You can buy pipe clamps from any home improvement or hardware stores. Alternatively, you can buy a braided tube made of metal. The tube is flexible and comes with compression ends to provide a permanent leak fix. The advantage of using this flexible metal tube is that it not only allows you to fix a minor leak from a small hole, you can also mend a split in the pipe. Also, the flexibility of the tube allows you to mend leaks in pipe elbows and corners. The metal tubes are available in any hardware or home improvement stores and come in a variety of lengths to help you fix any size leak. Installing the metal tube will require a bit more work, as you will need to cut out the piece of pipe with the leak. All the repair options mentioned above are quick fixes to get your water running again. However, should you have to deal with a burst pipe, it is advisable to seek the services of a professional plumbing company. A burst pipe will require specialized repairs to ensure that it does not happen again. Most new homes use copper piping and luckily copper hardly ever experiences leaks. However, older houses have galvanized piping and experience leaks more often. The rust is due to galvanized pipes rusting from the inside out. The rusting pattern of galvanized pipes makes it very difficult to isolate the leaking point. Also, once a galvanized pipe starts leaking, it is expected that the other pipes will follow shortly. With galvanized piping, it is best to invest in a new supply of piping. Most minor leaks are easily fixed with ordinary household items and will last long enough to give you time to get a more permanent solution. With more server pipe damage, it is best to seek professional service.